Perfect end to 30 years of the DTM as Gary Paffett (Mercedes-AMG Motorsport PETRONAS) is crowned DTM champion for the second time since 2005 in the 436th and final DTM race for Mercedes-AMG Motorsport. The British driver took third place in the brand’s home race at Hockenheim, the very last round of the season, beating off stiff competition from Audi driver René Rast, who won the fixture. Gary’s third place, giving him his tenth podium finish of the season, his 13th at Hockenheim and the 48th of his DTM career, was enough to win the championship with a four-point lead. Gary made his DTM debut in the 2003 season, driving an AMG-Mercedes CLK DTM. He has completed 15 seasons for the brand since first joining the DTM, and so, has been in the cockpit of a DTM car with the three-pointed star for half of Mercedes-AMG Motorsport’s 30 years in the DTM. During this time, he has secured 17 pole positions, 24 wins and 48 podiums. Edoardo Mortara (SILBERPFEIL Energy Mercedes-AMG Motorsport) finished the final race of the season in 13th position. Paul Di Resta (Mercedes-AMG Motorsport REMUS) had a narrow lead on Gary in the championship before this final race weekend of the season, thus keeping his title hopes alive until the final race which he finished outside of the points in 14th place. In the drivers' standings, he ended his ninth DTM season in third place overall. In early May, Mercedes-AMG Motorsport embarked on its 2018 special anniversary season with the first of ten meetings, taking a win in the first race at the Hockenheim season opener. 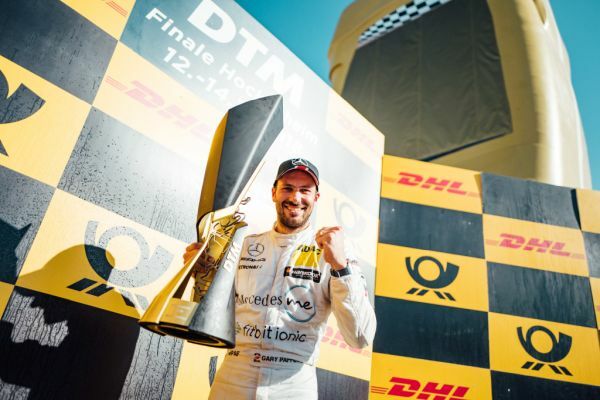 Contesting their home fixture today at the same venue, the team brought the final chapter in their 30-year history in the DTM to a close with a suitable end to a superb season. Four of the six drivers – Gary Paffett (3 wins), Paul Di Resta (3 wins), Edoardo Mortara (2 wins) and Daniel Juncadella (1 win) – finished on the top rung of the podium. Daniel Juncadella took his maiden win in the DTM at Brands Hatch. Of this season’s 60 podium places, 28 went to one of the team’s drivers this season (almost as many as the two other manufacturers put together). Gary Paffett also leads the rankings as far as the most podiums are concerned, having achieved ten in total. All of the team’s six drivers finished on the podium at least once this season. Mercedes-AMG won the constructors’ championship at the penultimate race weekend of the year in Spielberg. Ultimately, by the end of the season, the brand with the three-pointed star had notched up 903 points to BMW’s 623 and Audi’s 599. Mercedes-AMG Motorsport’s success in the DTM began thirty years ago when a works team was entered for the 1988 season. Since that year, the most successful brand ever in the history of the DTM has achieved many spectacular wins, set new records and experienced plenty of moments charged with emotion. With five titles to his name, Bernd Schneider holds the record for having won the most drivers’ championships in the DTM. What is more, he still holds various DTM records even to this day for number of races contested (236), pole positions (25) and wins (43).